Disney's Christopher Robin is a heartwarming, live-action adventure for the whole family. And it is coming home just in time for the holidays on Digital and Blu-ray November 6. Embark on a spirited adventure with grown-up Christopher Robin, Winnie the Pooh, and friends, and go behind the scenes to discover how Disney's beloved characters are brought to life. Disney's Christopher Robin, the wondrous, live-action film in which Winnie the Pooh and friends venture into mid-century London to help grown-up Christopher Robin (Ewan McGregor), arrives instantly on Digital and Movies Anywhere and on Blu-ray and DVD with captivating, behind-the-scenes extras. The fun-filled tale features A.A. Milne's timeless characters from the Hundred Acre Wood, Pooh, Tigger, Piglet, Eeyore, Kanga, Roo, Rabbit and Owl, making their first appearance as three-dimensional characters who remind Christopher Robin, and viewers of all ages, to appreciate the simple pleasures in life. This entirely new take on the Winnie the Pooh stories will transport parents back to the imaginative, carefree days of childhood and allow them to share their love of Pooh and friends with their own children. Says director Marc Forster. "When you are able to make people laugh and cry in the same movie and you are able to tell the story with integrity and ground it in reality and have the magic realism on top of it, it lifts your spirits and connects you with the people you love. We could all use a little bit of Pooh's heart and wisdom right now." Bonus features provide a heartfelt look at the making of Christopher Robin, showcasing the magical artistry that brings the classic characters to life, the human actors' techniques for interacting with stuffed animals, and the filmmakers' passion for their project. Bronte Carmichael, who plays Christopher Robin's daughter Madeline, takes viewers on an exciting journey from the drawing board to film locations throughout the United Kingdom. Features flash back to highlight Walt Disney's fondness for Winnie the Pooh and recall the voice actors who lovingly portrayed the unforgettable voice of the iconic character. An exclusive digital bonus feature explores the actual teddy bear, given to Christopher Robin Milne 98 years ago, which inspired the original Pooh stories that have been shared and adored by families around the globe. Christopher Robin will be packaged and released in several different formats, giving families the flexibility to watch the Disney film on a variety of different devices. Viewers can instantly watch the film in Digital HD and SD, and bring home a physical copy of the film as a Multi-Screen Edition (Blu-ray, DVD and Digital Copy) or a single DVD. • In Which ... A Movie Is Made for Pooh - Filmmakers and cast share their passion for this story in a behind-the-scenes look at the making of the movie. • In Which ... Pooh Finds His Voice - Discover what it's like to voice Winnie the Pooh, from voice actors Sterling Holloway to Jim Cummings. • In Which ... Pooh and Walt Become Friends - How did Walt Disney and Pooh meet? Take a journey through time to explore the legacy of Walt's first encounter with Pooh. • In Which ... Pooh and Friends Come to Life - See how Winnie the Pooh and Friends were brought to life as walking and talking stuffed animals in this magical live-action world. • In Which ... We Were Very Young - Meet the actual, original teddy bear who, along with his best friends, has inspired so much love worldwide for almost a century. A heartwarming live-action adventure, Christopher Robin is directed by Golden Globe nominee Marc Forster from a screenplay by Alex Ross Perry and Oscar winner Tom McCarthy and Oscar nominee Allison Schroeder and a story by Greg Brooker and Mark Steven Johnson based on characters created by A.A. Milne and E.H. Shepard. The producers are Brigham Taylor, p.g.a., and Kristin Burr, p.g.a., with Renée Wolfe and Jeremy Johns serving as executive producers. The film stars Golden Globe® winner and Emmy® nominee Ewan McGregor as Christopher Robin; Golden Globe nominee Hayley Atwell as his wife, Evelyn; Bronte Carmichael as his daughter, Madeline; and Emmy winner Mark Gatiss as Giles Winslow, Robin's boss. 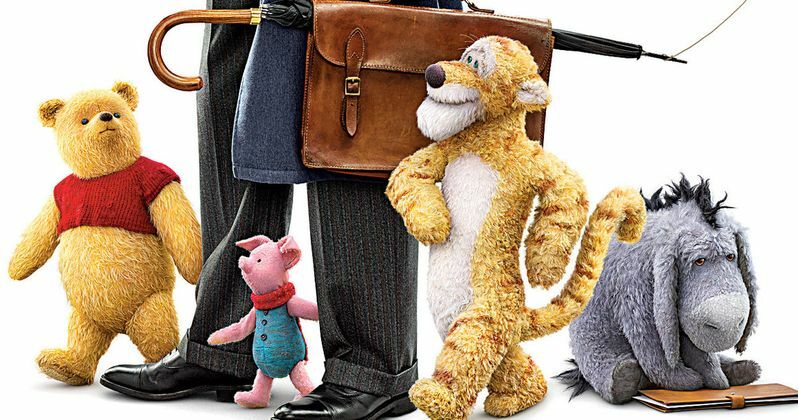 The film also features the voices of Jim Cummings as Winnie the Pooh and Tigger, three-time Emmy winner Brad Garrett as Eeyore, Golden Globe nominee Toby Jones as Owl, Nick Mohammed as Piglet, Oscar® winner Peter Capaldi as Rabbit and Oscar nominee and Tony Award® winner Sophie Okonedo as Kanga. Check out the trailer as provided for the Blu-ray and digital release by Walt Disney Pictures. Can Winnie the Pooh Stop Mission: Impossible 6 at the Box Office?